Toyota delivered its first Mirai fuel cell model to Japanese Prime Minister Shinzo Abe last week. After a short test drive, Abe said it was “very comfortable” and he wants all ministries and agencies to have the Mirai. TOKYO (Bloomberg) -- Tokyo plans to spend 45.2 billion yen ($385 million) on fuel cell vehicle subsidies and hydrogen stations for the 2020 Olympics as part of Prime Minister Shinzo Abe’s effort to reduce Japan’s reliance on nuclear power. Japan’s capital will build 35 stations to fuel hydrogen-based fuel cell vehicles and is in negotiations with Toyota Motor Corp. and Honda Motor Co. to put 6,000 hydrogen cars on its roads by 2020, said Makoto Fujimoto, who heads the planning team at the metropolitan government’s energy department. Japan is putting resources into hydrogen power after suffering its worst nuclear disaster since World War II in March 2011, when an earthquake and tsunami damaged the Fukushima Daiichi power plant. Spending on hydrogen infrastructure comes as Tokyo’s government is under pressure to rein in costs as it prepares to host the quadrennial games. 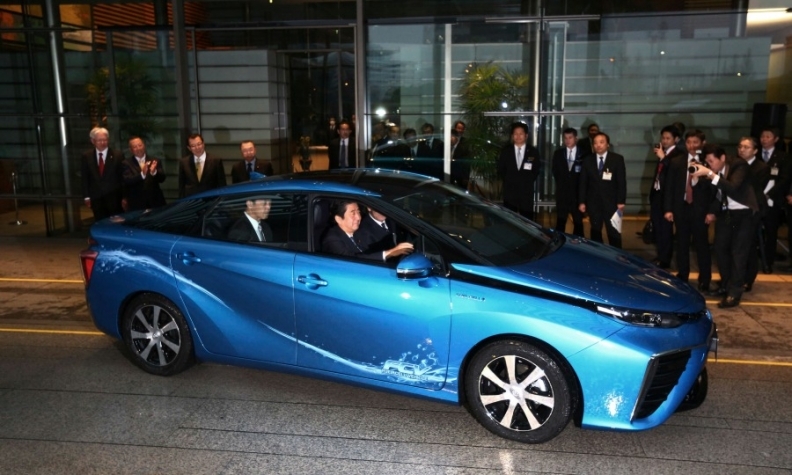 Last week, Toyota delivered its first Mirai fuel cell model to Abe. After a short test drive at his official residence, Abe declared it was “very comfortable” and said he wants “all ministries and agencies to have” the Mirai. “It’s time to introduce a hydrogen era,” he told reporters on Jan. 15. The Mirai -- meaning “future” in Japanese -- will be sold in California and Europe this year, can travel 300 miles on a single tank of hydrogen and refuel in three to five minutes. In the U.S., the Mirai's sticker price will be $57,500. The national government is planning hydrogen distribution facilities as it supports Toyota, which pioneered hybrid vehicles, to help popularize what the carmaker sees as the next generation of auto technology. Abe has said Japan intends to create a “hydrogen society,” with cells powered by the element also powering homes and office buildings. Japan’s fuel cell subsidies are bigger than the incentives that China, the U.S. and Europe are offering for electric-vehicle buyers. They are also more than triple the 950,000 yen of incentives Japan offers buyers of Mitsubishi Motors Corp.’s all-electric i-MiEV. Under the Tokyo Metropolitan Government’s plan, the city is targeting to have 100,000 hydrogen passenger vehicles, 100 hydrogen buses and 80 refueling stations by 2025. Buyers of fuel cell vehicles in Tokyo will be entitled to about 1 million yen of subsidies, on top of the 2 million yen provided by the central government, he said. Toyota President Akio Toyoda told reporters last week that the automaker was considering increasing production after receiving about 1,500 Mirai orders -- 60 percent of which are from government offices and corporate fleets -- in the first month, compared with its target of 400 by the end of 2015. Fuel cells are considered environmentally friendly because they convert hydrogen to electricity, leaving water vapor as a byproduct.